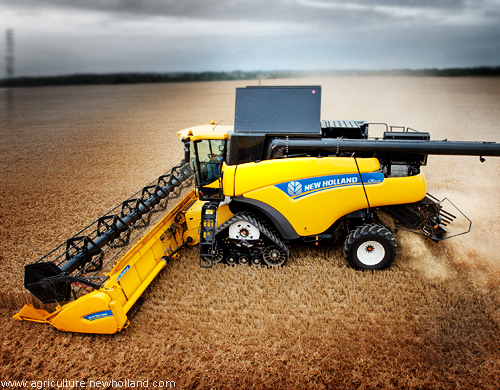 New Holland CR-Tier 4 / CR9090 Twin Rotor® combine harvester. With a 571hp(CV) FPT Industrial Cursor 13 engine and ECOBlue SCR technology for Tier 4A compliance, the new CR9090 has reduced fuel consumption by up to 10%. Its unique 22" Twin Rotor concept ensures in-line crop flow for the gentlest grain handling (only 0.1% broken grain) and generates more centrifugal force for faster separation, higher grain quality and more grain distribution on the cleaning system. An IntelliCruise system automatically matches forward speed to crop load, and the Advanced Stone Protection utilizes sound filters on the feeder floor to detect and eject stones other systems miss. The big, 3.12m3, and quiet, 74dB(A) cab for operator comfort boasts a IntelliView IV colour touch-screen monitor for intuitive management of all key harvesting. Wow this looks like such a beast, although the view kind of reminds me of a street sweeper machine.